Saturday, May 4 Update: The Sunday, May 5 Picnic and Pops concert of the Jacksonville Symphony Orchestra in Palm Coast’s Town Center was cancelled because of rain. “It’s so wet out there, it’s like a lake,” Palm Coast Arts Foundation President Sam Perkovich said, describing the conditions of the grass at Central park, where the concert is traditionally held, with tables and lawn chairs spread across the lawn. The concert will not be rescheduled for this year, but will be held next year, April 27, with this year’s tickets valid for next year. The cancellation is only the latest in a series of event cancellations this weekend, including First Friday in Flagler Beach, Saturday’s Relay for Life in Flagler Beach, and Palm Coast’s Arbor Day celebration, which was also to be held in Central Park. The Duck Dive for the Arts, on the other hand–the event organized by the Flagler Auditorium–is still on, and scheduled as originally planned for 4 to 8 p.m. Sunday at the Grand Club at Pine Lakes. The preview story of this year’s concert is below. It doesn’t get much better than this, especially in early May’s mellow air under constellations that know a good concert when they hear one: a giant potluck for 800, good wine, good beer, good Calvados or Dubonnet if you prefer, and then the music: the year’s only truly symphonic experience in Palm Coast, thanks to the 50-piece Jacksonville Symphony Orchestra, and the Palm Coast Arts Foundation, which makes this annual Picnic-and-Pops concert possible every year in Town Center: It all happens again May 5, a Sunday, at Central Park, starting at 6:30 with the picnic part, and at 8 p.m., right around dark, with Aaron Copeland, Leonard Bernstein, a tribute to Cinco de Mayo (the great Mexican-American celebration), and other classics brought to life under the direction of Morihiko Nakahara. 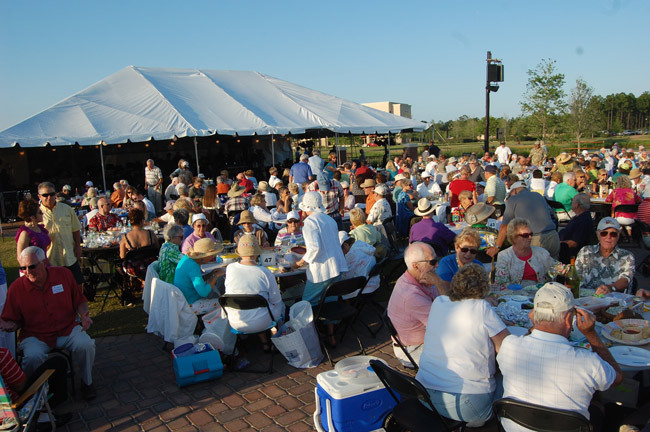 It’s the Palm Coast Arts Foundation’s seventh annual Picnic & Pops Concert. This year’s concert may resonate a little more fully, especially for members of the arts foundation (or anyone who cares about nurturing the arts in Palm Coast), because this time they’ll be hearing the music only a few dozen steps from the grounds they hope will become their organization’s home in the not-too-distant future: the ambitious organization has had its challenges, but last November, after a six-year slog, it planted the promise of an event center and sculpture garden on 13 acres southwest of Town Center Boulevard and Central Avenue. No stranger to these things, Nakahara first conducted the Jacksonville Symphony at a Picnic & Pops concert in 2010. 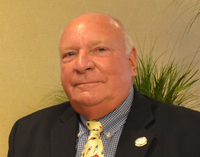 “I’m eagerly looking forward to returning to Palm Coast after a hiatus. I remember how enthusiastic, responsive, and friendly the Picnic and Pops audience was to the orchestra and me. This event strikes me as a fun, family-friendly gathering for the entire Palm Coast community, and we’re honored to play our part in this celebration once again,” says Nakahara. At last year’s Picnic and Pops, the Symphony was under the direction of Matthew Kraemer, the associate conductor at the Buffalo Philharmonic and a regular with the Jacksonville Symphony. The year before, it was then 21-year old Teddy Abrams, assistant conductor at the New World Symphony Orchestra. That night’s biggest surprise was quite unexpected, and it happened after everyone went home and turned on the tube. It was the announcement, within an hour or so of the Jacksonville Symphony playing its tribute to the armed forces, of Osama bin Laden’s killing. May 5’s surprises are likely to be more musically inspired. “We’ve put together a great selection for an outdoor festive concert,” says Paul Witkowski, the Jacksonville Symphony’s public relations director, including American music like Aaron Copland’s ‘Hoedown,’ (Copland at the pops is becoming a tradition) and Broadway hits from “Les Miserables,” “Westside Story” and an “American in Paris,” as well as others that are yet to be finalized. The event’s proceeds will go toward defraying the evening’s costs and the Foundation’s continued fundraising to build a super arts facility in Town Center, capable of housing grand symphonic performances, boasting 2,300 seats, at a cost of $30 million. Perkovich is optimistic because membership is increasing, and existing members are sending in money to renew. The county’s Tourist Development Council also played a large hand in what Perkovich hopes to be future gains (the council could potentially fund part of the foundation’s capital projects.) In regard to the local arts, she says, a general forward movement has commenced, particularly with the inception of the arts alliance (which met earlier today, April 18, in the theater of Flagler Playhouse, with as much enthusiasm as for a good new play). Another indicator of increased enthusiasm about the arts–and Picnic and Pops–is the involvement of the new Carrabbas Palm Coast restaurant, which hosted the first quarterly Hospitality Alliance meeting this past January, which was also attended by a number of arts organizations. Carrabas will be catering the sponsor tables at the concert. A regular Picnic and Pops goer each year, Palm Coast Mayor John Netts appraised the job and the direction in which the Foundation seems headed. “The group speaks for themselves. They get more and more people to attend their events each year,” the mayor said. “Something that I always tells people is cities and boroughs are defined by buildings and landmarks. Communities are defined by people and the way they come together to mingle and interact,” Netts says. “It’s great to be able to use central park—to use our facilities to bring people together. It lets us show what a great place Palm Coast is to show what we have to offer. One of the neat things about having access to the park is you can have almost any type of cultural event, like Picnic and Pops or Rock and Ribs, or International Food and Wine. Not everyone likes the same thing. It’s events like these that get people to come out and see their neighbor.” Just last weekend, the park was jammed with the annual Rock n’ Ribfest the city organizes with Beach 92.7 and Kix Country 98.7. It wasn’t Bach, but Bach was known to enjoy the odd rib, and he knew a good variation on great music when he heard one. May 5’s Picnic and Pops concert will be all variations on fun themes. Concert goers may bring food and drinks starting at 6:30 p.m., while the actual concert doesn’t begin until 8 p.m. Tickets are $35 for Foundation members, $40 for non-members, and $350 for a ticketed table. For the Flagler Youth Orchestra members and parents, tickets for lawn seating are available for $5. Tickets are are available now by contacting the Palm Coast Arts Foundation at 386.263.2991 or online by clicking here.